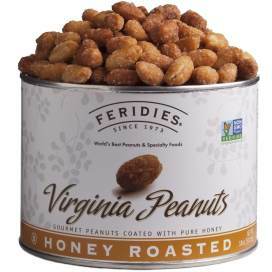 FERIDIES Honey Roasted Virginia Peanuts are covered in a light honey coating, creating the perfect combination of sweet and salty. Virginia Peanuts are a type of peanut known for their large size, crunchy texture, delicious flavor and high nutritional value. 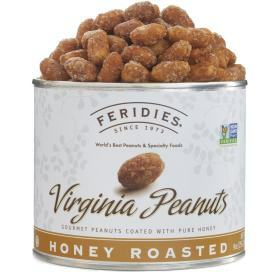 Covered in a light honey coating, creating an irresistible blend of sweet and salty, our Honey Roasted Virginia Peanuts are one of our best selling Virginia peanut candies. Offered in 4 different sizes for your personal enjoyment or gift-giving needs. OU Kosher Certified and Non-GMO Project Verified.